There were more than 700,000 cars stolen in the US in 2015. That's one every 45 seconds and 3.1% more than in 2014. Although car theft is punishable by incarceration, probation, or fines, thieves don't seem to be stopping. 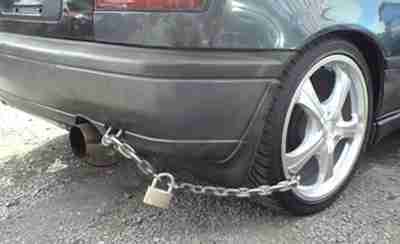 So what can you do to prevent your car from being stolen? Park Smart. Be smart about where you park your car— Dark and secluded locations, like carports, underground parking, and parking garages are more appealing to car thieves since there is less chance that they will be seen or caught. In a garage, they have their pick of vehicle. It is best to park your car in a well-lilt area, on the street or in your driveway. Take Keys. Don't leave your keys in the car, ever—Not even at the gas station or in your driveway to heat up your car in the morning. This is asking to have it stolen. Along the same note, do not leave a spare set of keys in your car since thieves know where to find them. Close Windows. Never leave your windows open, even an inch. Even with this small allowance, thieves will be able to get the window open enough to unlock the door. Tracking Devices. Purchase an electronic tracking device for your car like the LoJack which can help police locate your car once it is stolen. Some auto insurance companies will give their policy holders discounts on tracking devices. The 10 Most Frequently Stolen Vehicles of 2015, starting with the worst. * Full Size. Source: National Insurance Crime Bureau. To see a local ranking, go to NCBI and double-click on your state. LoJack, The Club, Ignition Kill Switches, and Viper Security System.